· In order to separate mixtures you need to devise a process that separates components with different properties. · The more similar the properties = the more difficult it is to separate them. o This is the most basic technique. o Magnets or sieves may also be used to separate mechanical or heterogeneous mixtures. o Ex. A dry mixture of salt and sand. *Note – manually picking out the sand does not change the chemical identity of the salt or the sand. o Boil away the liquid and the solid remains. o Selects components by particle size. Liquid and gaseous components will pass through the filter while the solid particles will be retained. Watch this youtube video on filtration! o Solids are then separated by filtration or floatation. Remaining solid comes out as pure crystals and they are then filtered from the remaining solvent. 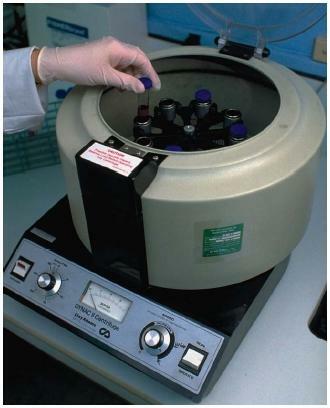 o A centrifuge whirls a test tube around at high speeds forcing the denser materials to the bottom. o A technique also called liquid extraction, used to separate liquids. o Mechanical mixture: (solid and solid) use liquid to dissolve one solid but not the other so the desired solid is left behind or dissolved. 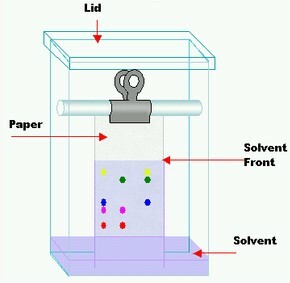 o Solution: solvent is insoluble with solvent already present. Solvent dissolves one or more substances and leaves unwanted substances behind. o Physical separation process. Not chemical. 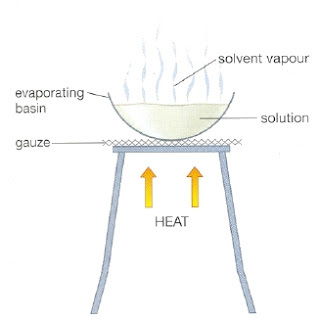 o The liquid with the lowest boiling temperature boils first- vapour ascents to distillation flask and enters condenser; gas cools and condenses back to liquid dropping the distillate as a purified liquid.